A new edition of the revolutionary bestseller, with four million copies in print. 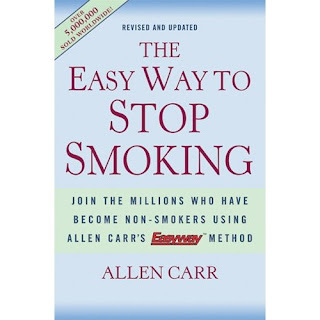 Allen Carr’s innovative Easyway method—which he discovered after his own 100-cigarette-a-day habit nearly drove him to despair—has helped millions kick smoking without feeling anxious and deprived. That’s because he helps smokers discover the psychological reasons behind their dependency, explains in detail how to handle the withdrawal symptoms, shows them how to avoid situations when temptation might become too strong, and enables them to stay smoke-free. Carr discusses such issues as nicotine addiction; the social “brainwashing” that encourages smoking; the false belief that a cigarette relieves stress; the role boredom plays in sabotaging efforts to stop; and the main reasons for failure. With this proven program, smokers will be throwing away their packs for good. Considering the long term benefits of smoking cessation such as low risk of succumbing to cancer, a significant reduction in mental stress, odorless breath et al, it is definitely necessary for you to start your quit smoking regimen as soon as possible. However, during the first few weeks, it may appear extremely difficult to get rid of this addiction, but as you consistently try to quit smoking for a certain period of time, your smoking cessation efforts would yield results.